Mark Twain has so many great quotes, but this one about word choices seems ideal when I'm in the process of writing a review of a vocabulary. I'm afraid that I am a master of using the "almost right word" and will do so frequently in this review. So I'm going to keep quoting others who are more eloquent than I. For the past few weeks, my family has been using a DVD-ROM from VocabAhead in our schooling. This product contains over a thousand words, put into short videos and mp3s. We primarily used the videos. The vocabulary included is billed as "SAT Vocabulary" and I'd tend to agree with that. I found this most useful for my high school student, though my 4th and 6th graders were using it as well. My kids tend to have extensive vocabularies. Probably because we do a lot of reading aloud (or at least we always have... we've been slacking lately) and we tend to use a variety of words in our everyday conversations. But there is always room for improvement. Connor tends to have a reader's vocabulary. There were a number of instances where he was telling me he already knew the word from looking at it on the computer... but we started listening, and he would end up saying, "Oh, so that's how you pronounce that!" Clearly, a video approach where he both sees and hears the word is imperative for this child. "Not the same thing a bit!" said the Hatter. "You might just as well say that "I see what I eat" is the same thing as "I eat what I see"!" We've been using this mostly as a video dictionary. 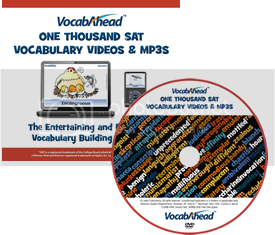 In whatever programs or reading we are doing, when we encounter vocabulary words, VocabAhead is the first place we check. We don't find everything in here, but we do find a lot of the words. A video starts off with the word and definition written on the screen, and read. Then a cartoon appears, with the word and definition printed underneath. Most cartoons have basically a short story where the word and some synonyms are used. Some cartoons have roughly three sentences, only one of which ties into the cartoon. At the end of the video, the word and definition are repeated. One great thing is that I can put these onto my iPod Touch, so I can have pre-loaded the vocabulary from IEW Medieval History, for instance, and while we are (hypothetically) hanging out at Arby's waiting for the van to get fixed, the kids can watch the vocabulary part of the lesson while I go get a refill of my soda. "I confess to wincing every so often at a poorly chosen word, a mangled sentence, an expression of emotion that seems indulgent or overly practiced"
There is also book available, which comes with a link to the videos for the 300 words included. The book has the advantage of also including synonyms and antonyms. The book is $12.95 and the DVD-ROM is $24.99, and you can see more about purchasing them here. You can check into their iPhone apps too. Or just browse around their website, as there is a lot of great information there. Disclaimer: As part of the TOS Homeschool Review Crew, I did receive a complimentary DVD-ROM from VocabAhead. The fact that I received complimentary products does not guarantee a favorable review. It does guarantee a review. A fair review. But I am not going to praise something unless I think it deserves the praise. If I don't like it, you'll hear that. And hopefully with enough detail as to why so you can decide for yourself if what I hate about it makes it perfect for your family. For more about my take on reviews, visit my blog post here. I love the quotes you included in this review and how you adapted this program for your children's use. You are so funny after the Barack Obama statement. I love all of the quotes that you used in your review.